Riders from Eritrea Broke Barriers at the 2015 Tour de France. Will they pave the way for women cyclists? Through sheer grit and determination, Eritrea’s Daniel Teklehaimanot and Merhawi Kudus became the first black Africans to compete in the Tour de France. People watched from all corners of the world as history was made. 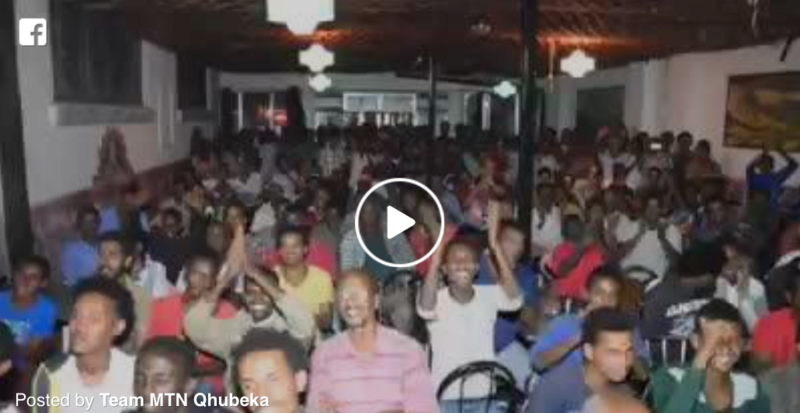 In their home country, exhilarated crowds in cafes and streets around Asmara cheered for Daniel when he received the King of the Mountains polka dot jersey on the sixth stage of the race. Across Africa, women athletes struggle for the same recognition and support. They have few opportunities to cycle. When they join professional teams, they receive little coverage. A closer look at the exuberant celebrations for Daniel and Merhawi reveals another glaring omission: Not a single woman was among the spectators in the capital city of Asmara. These disparities reflect a gender divide in Eritrea and many other African countries. After the success of Daniel and Merhawi, how long will it be before we see women cycling competitively in Eritrea and beyond? Can cycling become a source of women’s empowerment? We examined these questions with Kimberly Coats, the director of marketing and logistics for Team Africa Rising, a professional cycling team founded in 2007. What’s the mission of Team Africa Rising? Team Rwanda Cycling, AKA Team Africa Rising (our new name to better reflect the work we do throughout Africa, primarily Rwanda, Ethiopia, Eritrea), seeks to unify African countries through the sport of cycling. Team Rwanda was founded in early 2007 when Jonathan “Jock” Boyer returned to Rwanda after a 2006 bike race to test some athletes. What he found was some decent talent and an eagerness to learn. He’s been here ever since. Over the years as Rwanda gained more and more credibility and improved race results on the international stage, other countries began to ask for our help securing parts and equipment, developing training programs and helping to develop the federations and the cyclists. As many of our riders grew up during the 1994 Genocide, our team knew conflict and overcame conflict to race as one nation, one people–Rwandan. What we also found when working with countries such as Ethiopia and Eritrea was that cycling transcended political boundaries and issues. Eritreans and Ethiopians sat at the same tables during races, helped each other and expressed affection for their brothers on the other side of the border. It became very clear that the people didn’t want war any longer; it was only about the politics. Our goal with Team Africa Rising is to bring these cyclists together under one common goal, developing cycling on the continent and eventually becoming the first all black African team at the Tour de France. I began cycling in my early 30s after spending most of my life as a runner. The injuries continued to mount and finally I was encouraged by my doctor to find a new sport. I started cycling again. I tell people I am a recreationally competitive cyclist! I did a few races, but it was more about testing my limits personally on the bike. I have ridden ever since. I’m now 49. I currently work with Team Rwanda/Team Africa Rising as the Director of Marketing and Logistics, my formal title. I also do nutrition/meal planning and coach and work to develop the women’s cycling program throughout Africa. 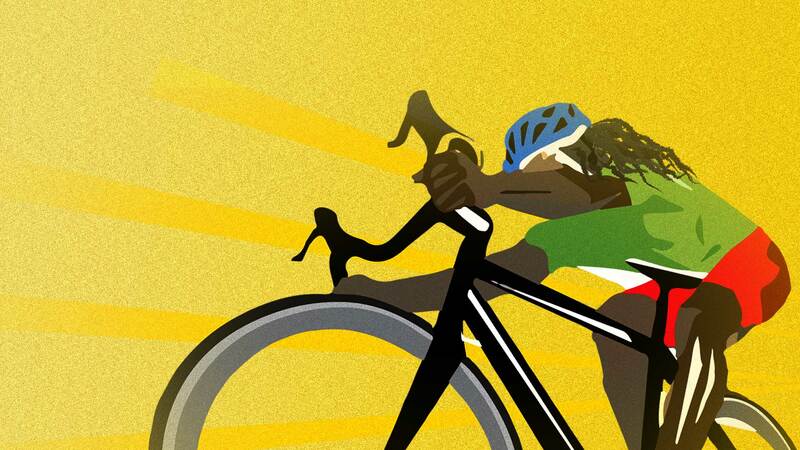 Cycling is male-dominated in Africa. What do you think are the main challenges for women to participate? The number one challenge is still cultural. Young girls in the U.S. grow up encouraged to play sports, to find an activity they enjoy. Here in Rwanda girls do not have that opportunity. There are no sports in school and girls who are lucky enough to remain in school are the fortunate ones. Most Rwandan girls, especially in the poor, rural areas (which is still most of Rwanda) may go to primary and perhaps secondary school, but then they are encouraged to marry and have children. Our current Rwandan cyclist, Jeanne d’Arc, is 20 and her parents are a real exception, super poor, but encouraging her to go for her dream to become a professional cyclist. Rwanda is still a very patriarchal society. It does have the highest percentage of women in the parliament. However, that does not trickle down currently. Women are still the ones in the field, working with babies on their backs and another in their womb. The women in Muslim countries have it even more difficult. I cannot imagine how difficult it is for them. Another significant challenge is money. We barely scrape by with our men’s National team and there is very little left over for women. There are never enough bikes, coaches or money to do everything we want to do for women and the men right now get us our sponsorship. It’s a vicious catch-22, which I struggle with personally as a woman. There are not enough races in Africa for women to get the experience they need to race internationally. These races cost money. No money, no races, no women’s development. In most cycling events in the region, almost all of the spectators are men. Why? It’s cultural and relates to the fact that women are always working. I sat with one of my Rwandan cyclist’s mother one morning and watched as she made baskets to help support her son and family while next to me was a small bar filled with men. It was 10 a.m. Women don’t do that here. They can’t; they’re too busy working. We need to keep pushing to have more women in racing at the organizational level. Rwanda has a couple of female commissaires (referees/judges), but, outside of myself, that’s it in the Federation. That needs to change. I think women are afraid to jump in and work in cycling, especially if, as in the case of Rwanda, they have no background in cycling. In Eritrea, it’s a bit different. There’s a woman who works within the Federation, a former cyclist herself, who runs the Eritrean women’s program. That will take a generation in Rwanda. If Jeanne d’Arc is successful as a professional cyclist on the international stage, she will eventually retire and hopefully bring all her knowledge and skills back to Rwanda and open the door for many more Rwandan female cycling coaches and staff. It’s just going to take time. Sadly, Ethiopia has quite a few talented women cyclists and ZERO women coaches or Federation staff. It is the good ‘ol boys network in full force. Do you think this is a generational gap or traditional beliefs that prevent women from enjoying the competitions or just a lack of interest from women? I think with the 35+ female population, at least in Rwanda, it is traditional beliefs that it is “not their place.” I think it is changing though with the younger generation. The Rwandan Federation President and VP bring their daughters to races, and the president of the largest Rwandan club, Team Benediction, brings his daughter and wife to the events. It is perplexing for me to see the lack of female spectators for the women’s races in Eritrea and Ethiopia. Hopefully the girls racing now, who retire in the next 10 years, will be the women encouraging women to attend races and come out in support of their sisters. Do you think cycling has other social implications that might change the way women are treated in society? Absolutely! Cycling has given women like Jeanne d’Arc (RWA), Hadnet Kidane and Eyerusalem Kelli (ETH) and Mosana Debesay (ERT) an immense amount of confidence and chutzpah. It is allowing these women to break down traditional barriers and to show the world who they are. It’s not going to happen overnight, or even in the next decade, but they will affect change and give women another view of life which can be had in their countries. You’ve worked with professional women cyclists and closely understand their successes and the challenges. What do you think needs to be done to grow the sport of cycling among women? To grow the sport of women’s cycling internationally, not just on the continent of Africa, we need money. We need sponsors to understand the unique opportunity they have to support a growing sport. Women in the U.S. and Europe control much of the spending. What better way to advertise than supporting local bike races. In Africa, the sport will never grow unless sponsors and governments invest in cycling so the young women racing on the continent today can inspire the women of tomorrow to not only race but spectate and support. The more exposure women’s cycling gets, the more support it will garner, but the investment must start somewhere. There needs to be a leap of faith for the future of the sport. It’s also important that women are paid the same as men. There’s a documentary which was released last year called Half the Road, by Kathryn Bertine. It’s about leveling the playing field so women get the same prize money as men. Through this initiative, they were able to get more women’s races in conjunction with men’s races such as at the Tour of California, Tour of Utah and Tour of Colorado. Unfortunately, we have not had the same luck here on the African continent. I have been pushing for a women’s Tour of Rwanda for two years and have not gotten far. The objection always thrown back at me is lack of funding. Sadly, the Rwandan football team gets loads of funding from a female Minister of Sport and women’s cycling gets nothing. One of our goals is to run a Women’s Cycling and Coaching camp in January 2016 at the Africa Rising Cycling Center in Musanze, Rwanda. We have asked the UCI and the Confederation of African Cycling to fund this camp to train 16 cyclists and eight women coaches for a month. They would be from eight different countries. This would help these women — cyclists and coaches — go back to their countries, their federations and work toward garnering more support for the sport. I am a relentless crusader for this initiative for these women! How do you think the benefits of more women cycling can improve other parts of society? I believe if women gain confidence through the sport of cycling, they will have a better self image. They will be stronger and will not succumb to the pressures of getting married young and having too many children. These women will be able to change the way society views them and their worth to society. These women will inspire the next generation of young women to go for dreams they never thought possible. It only takes one to open the door.